Okay, so yesterday our schedule got shot to bits. We ended up in a pretty nice place although a good bit out of our budget. We also managed to get a sandwich for dinner and it could have been worse – nothing. Also, our breakfast at the Casa was what we expected, warm juice, warm yogurt (I didn’t dare), warm ham and cheese and stale bread. So who cares? 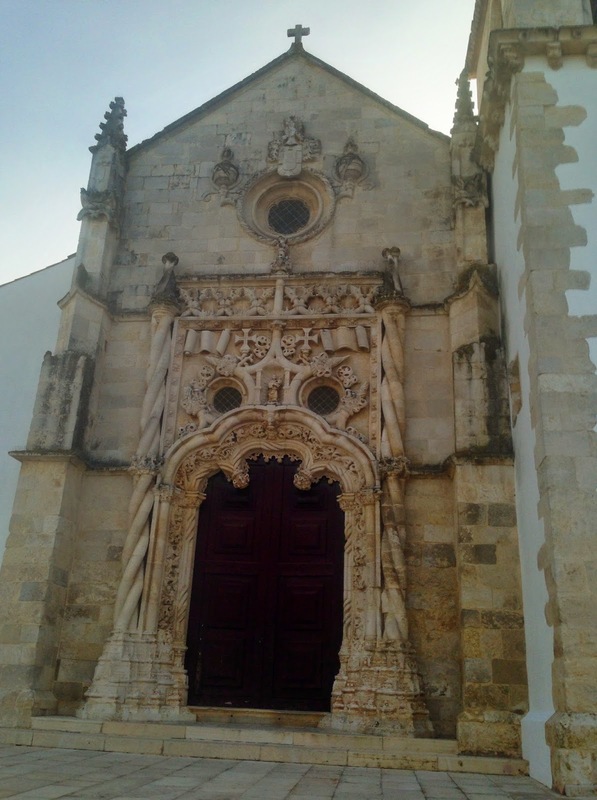 Atalaia is a modern town but with awesome old accommodations at Casa do Patricarca. It’s a huge old manor house with beautiful gardens, excellent rooms, 40€ for a double room (washing machine and breakfast included), wi-fi, several nearby cafés, a restaurant, a pharmacy, a mini-market, a refrigerator to keep breakfast cold and not a Belgian in sight. The people of the town are all super nice (at least the ones we met) and – to really win me over – we had a ham and TOMATO sandwich for lunch today! The walk today from Azinhaga was greatly varied. We had long stretches on the quietest of back roads that are barely ever graced by cars. We also had too many stretches along tiny busy roads that had us jumping into roadside foliage to avoid cars who were either passing each other near us, driving at 120km/hr or had a driver on the phone. There was a low fog through more than half the morning and the weather, for the first time for us in Portugal, was actually chilly. You can’t beat that for walking. Golega looked like a great town to have spent the night but we just stopped for breakfast (cafe Americano, sine azucar, sine leche for Melanie and B! Limonada for me with a delightful “that” cake to share). Further on, at Sao Caetano, we had some fruit while resting in the shade on benches that looked like they were set up for passing pilgrims. Just beyond that town was Quinta Cardiga which looked like a huge, lovely restored old farm manor house. I’ll have to google to learn more about it (apparently, it belonged to the Knights Templar, back in the day. The first construction on the property began in 1169 and the King of Portugal stayed in the house at least one night in 1580). There was a small bridge that was next to the Quinta that looked like many hundreds of years old but it was important for another reason too. It spanned a steam that emptied into the River Tejo just beyond it. We have followed the banks of that mammoth and historic river since Lisbon but at the Quinta, it turns east as we continue north. It was a good companion. Random thoughts for the day are about dogs, from the mouse-sized critter running around Casa de Azinhaga to the massive to the pony-sized monster that tugged at his master’s weight to try to eat us this morning, we have enjoyed them all. There was a Golden Lab that was resting in the shade in a yard yesterday. He lazily opened a single eye to watch us pass but when we laughed at his lack of a killer instinct, he bounded up and over to the gate like a new puppy to see if we would play with him. Another mutt this morning ran to greet us at breakfast from the fire house across the street. He repeatedly ignored the bombeiro to keep returning to us. Our favorite so far was the collie in Santarem who was taking a woman for a walk. At the point where we met her, the dog just stopped moving. We stopped to pet him and encourage him to move but despite the pulling on the leash from the woman, he just stared at her with mournful eyes and held his ground. Finally, the dog sat on his hind legs and looked over his shoulder. The woman finally understood – both what the dog wanted and who was boss – and she started to move in the direction from whence she came. The dog hopped up and pranced on his way. I love dogs. 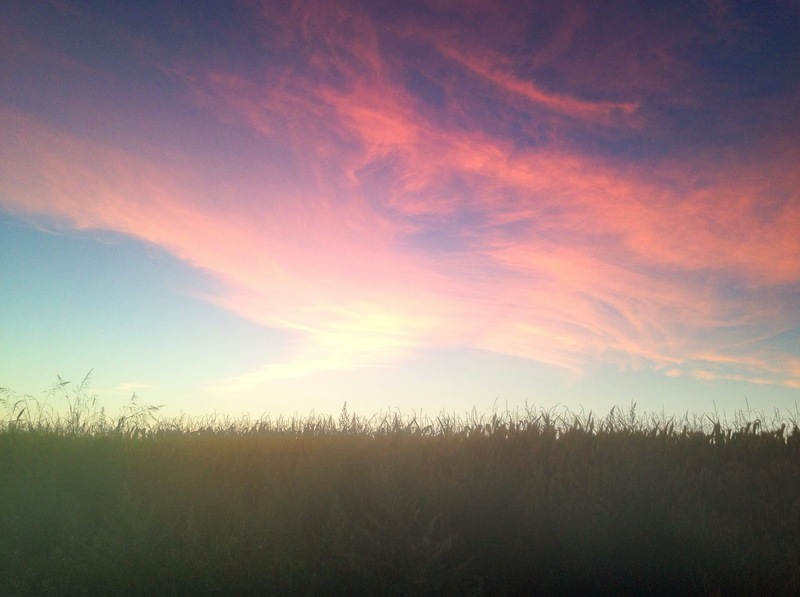 Sunrise over the cornfields before Golega. We often left just before sunrise to enjoy walking in the coolness as well as seeing the sun rise.